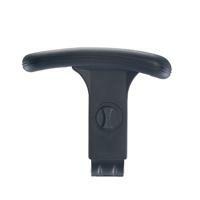 Designed to fit to Arista Mid Range seating, these adjustable arms are the optional addition to your office chair. Customise the height and angle of the arm rests to suit your own posture and favoured sitting position, keeping you at ease throughout your working day. This pack contains 2 black arms.